Review: This is about a relationship between an office clerk and a housewife. It all began after a mistaken lunch-box delivery prompts them to start writing to each other. This is a subtitled Hindi language drama. When it came out it was a huge success in its native India. The original title for this film is Dabba. It is a very sensitive film and very well handled. It is beautifully acted and with so many amazing scenes. I found it very moving in so many different ways. It also portrays wit, warmth and charm. In this you really got the sense of what life is like in India. You could even smell the atmosphere and got a sense of what the streets are like. There is a scene in this where the guy goes home at the end of a day’s work and you can just see him in his empty house and standing outside having a cigarette. You start to feel sorry for him that he hasn’t really got much in his life or to even go home to. We just find him completely isolated from everything and everybody. The script was very well written. If both couples had met would they be any happier? Another film similar to this to do with communication is You’ve Got Mail, 1998. 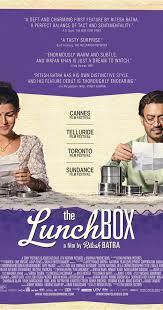 At the Cannes Film Festival in 2013 Ritesh Batra won 1 award for Grand Golden Rail.